Boscobel House is a historic timber-framed building built by John Giffard in about 1632. Giffard's modest house replaced an earlier farmhouse that existed here since the 16th century. The Giffard family were staunch Catholics at a time when Catholics were heavily persecuted, and it is possible that Boscobel House was intended to serve as a refuge, or hiding place for Catholics. Boscobel's moment in the spotlight of history occurred in 1651, when Charles, Prince of Wales (the future Charles II) sought refuge here after the Battle of Worcester. Charles, son of the executed King Charles I, made an unlike bid to retake the throne. His army was defeated at Worcester, and Charles had to flee for his life. He tried to escape into Wales but found his route cut off by Parliamentary troops. He was forced to hide with a companion in the leafy branches of an oak tree at Boscobel, a tree which became famous as the Royal Oak. He then found a somewhat more comfortable refuge in a priest's hole, or hidden chamber, in the attic of Boscobel House. From there he eventually made his way to France and safety. 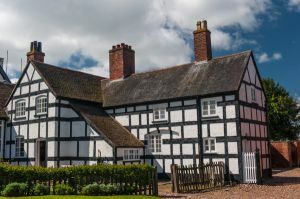 After the restoration of the monarchy, Boscobel House and the Royal Oak became very popular with visitors, though the house itself was never more than an attractive farmhouse. The oldest section is the north wing, which stands two stories high. The main section of the house, built around 1630, is set at right angles to the north wing. A later Victorian farmhouse range completes the house. There are a couple of family rooms on the ground floor, with period furniture. Upstairs are bedrooms, one of which gives way to a small closet. In the floor of the closet is an access opening to a hidden chamber. There seems to be some doubt if this chamber is original or added later. But if you ascend to the attic, under the gables, there is a second secret chamber, visible through a clear glass cover. This is thought to be where Charles hid. He would keep watch out the window under the gable and disappear into the hole if anyone approached. From the main house there is a projecting wing, which was the original farmhouse. This now has a dairy on the ground floor, while the upper floor is used for events. This is unfurnished, but the benefit of that is that you can easily see the timber framing. The house is surrounded by a small formal garden which dates to 1651 and was restored in 1812. The Royal Oak in which Charles found refuge no longer stands, however, about 137 metres south west of Boscobel House is a tree thought to be a descendant of the original Royal Oak. To reach the tree you have to exit the gardens and follow a rather loose 'path' across a farm field. The tree is protected by an iron railing, and nearby is a younger sapling grown from a cutting. An even more recent tree stands in the garden, grown from a seedling taken from the Royal Oak and planted by the Bishop of Lichfield for Queen Victoria's Diamond Jubilee in 1897. Near the tree is The Mount, a medieval mound topped by a modern hut. According to historical accounts, Charles II liked to spend the day here reading. There is a very attractive walk from Boscobel to the ruins of the medieval White Ladies Priory, which takes about 20 minutes each way over quiet country lanes and farm fields. We've taken the wallk on a lovely sunny day in summer and it was really very pleasant. The landscape is pretty and though the priory ruins are not extensive, they are quite interesting and makes a fun contrast to the main house. Location: On a minor road just south of Bishops Wood, almost on the border with Staffordshire. On site parking. Seasonal opening only.